View the latest deals on enamel aerosol paint, seat covers, washes, oils, and many more products are available on Supercheap Auto Catalogue. Find suitable prices of diesel engine oils on pg 4-5. Pay only $23.89 for Shell Helix HX3 engine oil to save $5. New products of car cleaning are the things to encounter in this catalogue. Turtle wax scratch repair, hybrid snow foam, and hybrid seal & shine are the new items on pg 3. Supercheap Auto exclusive products are possible to spot on pg 3. Buy Septone 400g acrylic aeresol & primers with a 25% discount. The catalogue also shows the prices of motorcycle oils. Save 15-20% on oils that are viewable on pg 6. Buy pressure washers for tough places with a lot of discontents. 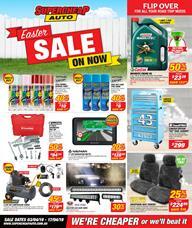 You should browse pg 7 to see the latest discounts by Supercheap Auto. If you have a garage where you work on some DIY projects, you might find tool storage products interesting. They are available on pg 8 and some good deals are available on that page. Find power tools, trolley, and more on pg 8.